On February 6 the Network for Oil and Gas (NOG) in Sweden organised a symposium at which the World Energy Outlook 2013 report was discussed, primarily in terms of a changing energy market. Personally, I was interested in what Bo Diczfalusy, ‎Director at the Swedish Ministry of Enterprise and Energy, would say about WEO 2013. 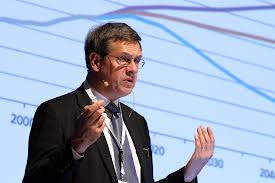 From December 2009 until December 2012 he was Director of the Directorate of Sustainable Energy Policy and Technology at the International Energy Agency (IEA). That means that he is well acquainted with the production of WEO reports. His presentation on WEO 2013 did not differ significantly from that given by the IEA’s Chief Economist Fatih Birol last autumn. Possibly he pointed out even more clearly that the WEO report is a scenario calculation restricted by certain assumptions. Elin Akinci from the Energy Authority gave a more detailed description of the natural gas scenario that exists in WEO 2013. Those of us who had had the opportunity to read WEO 2013 had expected to hear a certain degree of interpretation of the report but the IEA’s statements proved to be the final world from the Swedish Energy Authority. Ulf Svahn, the Managing Director of The Swedish Petroleum and Biofuel Institute (SPBI) is a Swedish representative on the World Energy Council (WEC) and at their meeting in South Korea (5000 delegates) they discussed what they called the 7 myths about the future of energy. (You can read their statement on the 7 myths below.) The NOG symposium’s moderator Staffan Riben had invited Ulf Svahn to compare the views of the WEC with those presented in WEO 2013. Ulf used the 7 myths as a starting point for his comparison. In terms of future energy demand the WEC sees no future decrease. He stated something that has become an economic axiom, that there will always be global economic growth. (An axiom is a statement assumed to be true as a basis for a line of reasoning.) The question is whether this axiom is the myth that actually needs revealing. One driving force behind the world’s increased energy demand is the world’s increasing population. Each individual requires energy. If this population increase levels off around 2050 and we take advantage of the possibilities that exist for increased efficiency of energy use then our total energy demand may level off. However, in reality that will mean that a large part of the world’s population will live below the “energy poverty line”. Regarding myths 3 to 7 I have no great objections. When Colin Campbell and I coined the term “Peak Oil” in December 2000 and then organised the world’s first Peak Oil conference in Uppsala in 2002, I never imagined that ten years later Peak Oil would be discussed by the WEC and dismissed as the second global myth. I can only state that we have been very successful in spreading what is currently termed “Peak Oil Theory”. Ulf used the USA’s production history and a fitted Hubbert curve as a symbol for Peak Oil but he also mentioned ASPO’s definition in which “depletion” is the decisive word. It is important to point out that the Hubbert curve is not the definition of Peak Oil rather than an example of how a production history can look. The WEC dismissed Peak Oil by stating, “The Reality: There is no shortage in sight. The continued discovery of new resources and the emergence of new technologies that both enable the release of unconventional oil and gas and improve the recovery rates from existing fields have already multiplied the available fossil fuel reserves by a factor of four, and this trend will continue.” I assume they are referring to oil reserves and not total global fossil fuel reserves. Further, there is a very distinct difference between resources and reserves and even if one has a large reserve that does not mean that it can quickly be converted into a production flow. For example, at the moment only 0.4% of the oil sands that is regarded as reserves is currently produced each year. The resources of shale oil are even larger but the reserve that the USA’s energy authority considers is producible is currently around 60 billion barrels of oil, i.e. as much as the world uses during two years. Theoretically, the maximal rate of oil production from these reserves in the USA could be 4 Mb/d or 1.5 billion barrels per year which is equivalent to 2.5% of the available reserves. By citing seemingly huge resources and reserves they hide the real truth that we have limited opportunities to produce new oil to meet existing demand. The moderator Staffan Riben began by stating that Kjell Aleklett should not comment during the symposium but he also promised that I would be able to comment when the various presentations were to be discussed. Some of the comments here were also part of the comments that I contributed at that time. After Bo Diczfalusy’s presentation an interesting question was posed as to why the IEA does not publish the limiting conditions that they use to construct their scenarios. The frank answer that was given was close to what I have always said about the IEA, but to hear it coming from a former departmental head of the IEA was somewhat amazing. Bo Diczfalusy has been responsible for the report “Energy Technology Perspectives 2012”, a report that describe the extent to which technological advances can contribute to useable energy provision in future. He asserted that he has published all the limiting conditions for the scenarios so that those who wished could check their calculations. At the same time he admitted that he had been criticised for doing this. Regarding the WEO he said that Fatih Birol had knowingly decided not to publish the limiting conditions for the scenarios so that others could not criticise the calculations the IEA had performed. This means that, in the long run, the WEO reports will carry greater authority as political documents as no one can check their calculations. In WEO 2008 the IEA published a number of detailed figures that gave my research group the opportunity to determine some of the limiting conditions and, thereby, question the validity of the IEA’s scenarios. Since then the IEA has been very careful to not make the same mistake. According to the statement that state secretary Bo Diczfalusy made, we now know that this has been a conscious decision. I hope that Bo Disczfalusy is willing to repeat this statement in a more official environment but there were many of use that heard what he said at the NOG symposium in any case. The Reality: Energy demand will continue to increase and double by 2050, primarily driven by economic growth in non-OECD countries. The Reality: There is no shortage in sight. The continued discovery of new resources and the emergence of new technologies that both enable the release of unconventional oil and gas and improve the recovery rates from existing fields have already multiplied the available fossil fuel reserves by a factor of four, and this trend will continue. The Reality: WEC analysis in the World Energy Scenarios shows that despite significant growth in the relative contribution of renewables from 15% today to a figure between 20% and 30% in 2050, in absolute terms the volume of fossil fuels used to meet global energy demand will be 16,000 MTOE in the Jazz (the more consumer-driven scenario) and 10,000 MTOE in Symphony (the more voter-driven scenario), compared to 10,400 MTOE in 2010. This represents a 5% decrease in the absolute amount of fossil fuels in Symphony but a 55% increase in Jazz. The Reality: According to the WEC’s World Energy Scenarios, even in the best case we will see a near doubling of global greenhouse gas (GHG) emissions by 2050, compared to where we should be in 2050 to meet the 450 parts per million CO2 reference adopted by many. At worst GHG emissions could increase by over four-fold. The Reality: WEC analysis shows that energy markets are become increasingly complex, driven by accelerated change in energy policy, technological innovation, and consumer expectations. Current market designs and business models are unable to cope with the increasing renewable shares, decentralised systems, or growing information architecture. The Reality: Universal access is far from becoming a reality. While acknowledging recent progress and current programmes to reduce energy poverty, the WEC’s analysis shows that on current paths, between 730 million and 880 million people for Jazz and Symphony respectively will still be without access to electricity in 2030 and between 320 million and 530 million people in 2050 globally. The Reality: Capital is extremely sensitive to perceived political and regulatory risks. Moreover, due to the growing pressures on public finances in most countries, public funds will not be available to substitute or augment the private financing of energy initiatives.